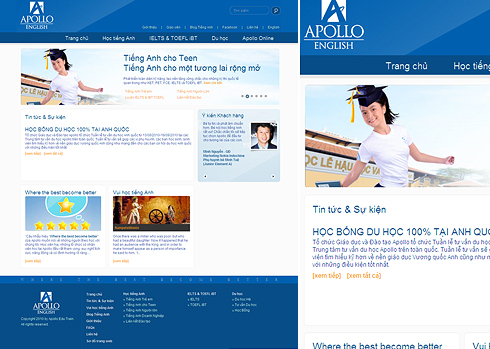 Founded in 1994, Apollo Vietnam is the first fully foreign owned English language training company in Vietnam, and is an affiliate of International House, a well established and trusted name in English teaching. Through its six modern and international-standard centers located in Ho Chi Minh City, Hanoi, Danang and Haiphong, Apollo offers a wide range of educational programs and services for children, adults and corporations. Among Apollo’s many accolades are two campaign medals for “the Cause of Education” from the Vietnamese Ministry of Education and Training, the first awarded to a foreign organization. In 2008, Apollo’s Chairman of the Board of Directors was also awarded the MBE (Member of the British Empire) by Queen Elizabeth II for providing international-standard English training in Vietnam. Apollo is also affiliated with British University Vietnam, which offers UK degree programs to students on its Vietnam campus via its association with the University of London and Staffordshire University.